There are certain little places in this town that you can't imagine finding in cities like Los Angeles or Chicago or Miami. Maybe not even Seattle. I'm thinking of places like Bread & Ink Café on Hawthorne or Three Square Grill in Hillsdale. Places where the cup of coffee is fresh and strong and they make everything on premises, often including the bread on your sandwich. They're usually located in neighborhoods that are funky rather than fashionable, where the 'hoodies have more hang than hype. Such a place can be found in the University Park neighborhood on North Lombard. Called the Little Red Bike Café, it sits along a fairly anonymous stretch of that boulevard, but once inside you realize it's anything but. With great breakfast items and lots of homemade pastries, plus great lunch items, this place is looking to gain a reputation as a terrific spot to eat. I went in for lunch and not only had a great cup o' joe but a fabulous sandwich of roast beef with gorgonzola, caramelized onions and buttermilk horseradish dressing on a ciabatta roll. The beef was deeply flavorful and the onions couldn't have been more perfect. And, of course, in typical Portland fashion, their coffee is roasted by a local micro-roaster called Courier Coffee Roasters, a business started, according to the café's blog, by a coffee afficionado named Joel who roasts the beans himself at his roastery in the Hawthorne neighborhood and then delivers them by bike to his several commercial customers. The café even has a Bike-Thru-Window (with two happy customers, right) that's open from closing till around 5 that serves Courier coffee, espresso and other beverages, as well as homemade ice cream and grilled cheese sandwiches. I tell you, if this city gets any sweeter, people are going to think we're making it all up! 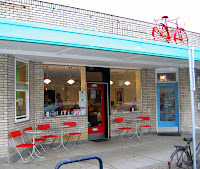 Details: Little Red Bike Café, 4823 Lombard St. Phone 503-289-0120. I'm telling my cycling Portland pals about this place...I had read something about the bike-riding-coffee-roasting guy, only in PDX, the coolest place on the West Coast! Definitely do! And like I said, stuff like this is so cool it's hard to believe it can all happen in one place. Love it!